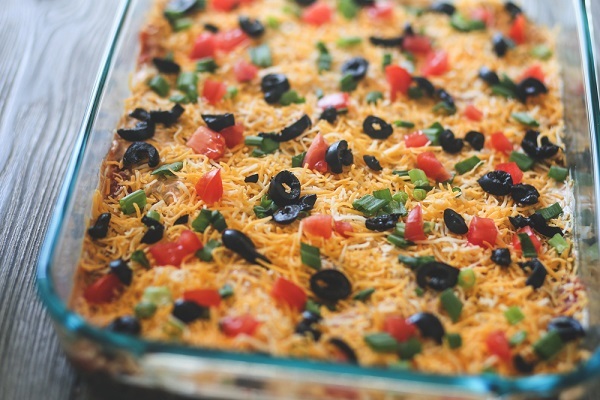 In a serving dish, spread both cans of bean dip evenly. Next, in a medium bowl, mash the avocados and add the lime juice, salt and pepper. Spread the avocado mixture over the beans. Mix the sour cream and taco seasoning together and spread over the avocados. Sprinkle the onions over the sour cream, and then add the tomatoes. Finally, add the cheddar cheese and olives. When preparing the dish, make sure you treat each ingredient as a separate layer and that you have a serving dish that is deep enough to contain all 7 layers.